The new standard for racing clutches is now available, with the EXEDY Hyper Compe Series. The ultralight metal multi-plate was developed with a focus on those interested in racing of all sorts. This fields-proven performer has posted numerous wins and boasts excellent reliability in a variety of leading categories. Exceptionally fast shifting and the lowest possible weight are the features of this competition model. Available in both Compe-R and Compe-D configuration, drivers are given the choice of rigid or damper discs depending on their needs. Both however come equipped with a lightweight forged aluminum clutch cover and ultra-light drilled chromium-molydenum flywheel, which allows us to achieve the lightest possible setup. Additionally, the grooved center plate provides improved disc release for better disengagement at any RPM. The Compe-R will be the absolute lightest setup available, utilizing 6 puck, 180mm or 200mm rigid discs. The Compe-R excels in environments such as time attack and Gymkhana, where fast shifting is desired over streetability. The Compe-D is an updated version of the Compe-R which uses a high-capacity damper disc that protects the drivetrain from damage. The Compe-D is an ultralight metal twin model with damper discs developed for frequent drift and circuit driving along with limited street use. 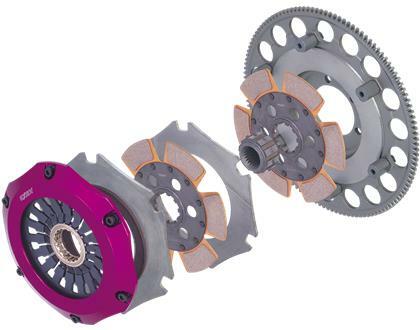 All EXEDY Racing Hyper Compe Series Clutch Kits carry SFI 1.2/1.5 Certification. Which means, when you buy these products, you can be confident they are certified for use in competitive motorsports.